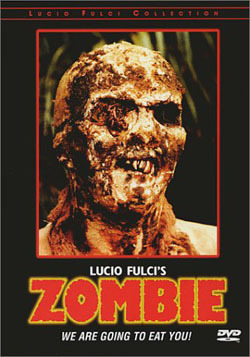 Day four of Italy week was Lucio Fulci’s hallucinogenic masterpiece Zombie. It did not let me down. On the other hand, it did not win my girlfriend over — her complaints included bad acting, terrible dialog, terrible dubbing and way too much cheap gore. I’d personally call the acting functional, but I yield that the dialog is highly suspect and the dubbing is ludicrous. I love the gore though, and think it looks great — maybe not exactly realistic, but totally believable. And obviously, I love the movie and have loved it each and every time I watch it. It comes down to looking for different things — she likes very linear, dialog and character driven movies (usually ones with no zombies in them) whereas I look for a movie experience that may or may not contain those things, but weighs all sorts of things like mood, camera work, stylistic flourishes, etc. that she doesn’t really register as terribly important. 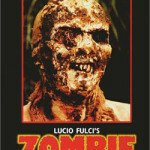 Zombie is a movie experience and Fulci was a master of using the camera,Â using sound design, setting a surreal mood and creating great set pieces. This is the most linear, plot-driven movie of his I’ve seen — I think it’s a good thing I didn’t try to have her watch The Beyond. We watched it in a little theater under a bar. It was a digital projection off DVD, but still freaking cool. This is definitely a movie to watch that way (in a theater, on a screen, with other people there) if you have the opportunity. It’s a different experience than watching it at home on your TV. The turnout was pretty small (I am a terrible promoter, and couldn’t dedicate a lot of time to it since it was a not-for-profit enterprise) but everyone that came, with the exception of my girlfriend, really dug the movie — even the people that came in two-thirds of the way through. Also, thanks to the people that voted in my poll, especially those that are watching along with us this month. Don’t forget that if you write about the films I watched and wrote about and link back to my writings on the same films, I will return the link/favor and we’ll have a cool little zombie film club. Fun! I closed the poll, since it is over halfway through the month, but I will have something else up there shortly. 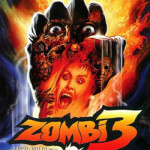 Next up is Zombie 3, a movie that Lucio Fulci started (cool!) and Bruno Mattei finished (uh oh…). That will end our five day excursion into Italian zombie cinema.